This blog originally appeared on the Million Moms Challenge blog. However, women – particularly those living on less than $2/day — are not benefiting from cell phone technology equally to men. Our research found that a woman in a low- to middle-income country is 21% less likely to own a cell phone than a man. This cell phone gender gap represents at least 300 million women in the developing world without access to this potentially life-enhancing tool. 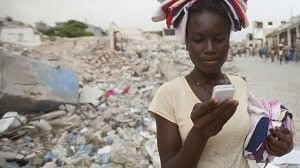 To address this gender gap, the GSMA, which represents the interests of the global cell phone industry, the U.S. Agency for International Development (USAID), the Australian Agency for International Development (AusAID) and many others are working together through a public-private partnership. As part of our work, we asked women who represented the cell phone gender gap – those who did not own a phone – how they felt a cell phone could benefit their lives. 80% reported it would help them be better connected to friends and family, 58% said it would be useful in an emergency, 40% said it would cut down on travel time, 18% said it would help them with their businesses and 15% believed it would help them feel secure. When both time and money are scarce resources, tools – such as cell phones — which can preserve either are of huge, practical benefit. However, in order for women living on less than $2/day to truly benefit from cell phones, they must both know how to use them and be allowed to do so effectively. The GSMA mWomen Program works with partners in the cell phone industry and the U.S. and Australian governments, to identify ways to close this technology gender gap in the developing world in order to change women’s lives. Our collective goal is to create products and services that meet women’s real, lived needs, and support them in tackling their challenges and achieving their hopes and dreams. We want to enable them not only to survive, but also to thrive. If you want to learn more, please visit www.mwomen.org and follow us on Twitter @GSMAmWomen and @USAID.